Buy Books, DVDs and other merchandise relating to Sherborne Developmental Movement. 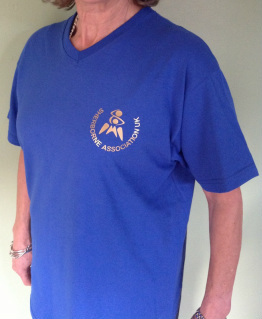 Universal fit (pictured): Royal Blue V-Neck T-shirt with Metallic Gold print front & back. 100% Cotton ‘relaxed’ fit. Taped back neck. 165gsm weight. 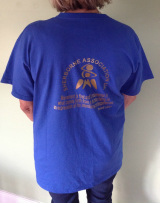 Also available in ladies fit: Royal Blue crew neck T-shirt with Metallic Gold print front & back. 100% Cotton womens cut with shaped side seams. Taped back neck. 165gsm weight. This exciting new book is available directly from the Sherborne Association UK using the following Paypal button (no PayPal account required). Available to buy through Amazon by clicking on the following link. 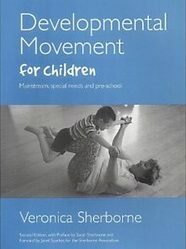 Find 'Developmental Movement for Children' by Veronica Sherborne at Amazon. 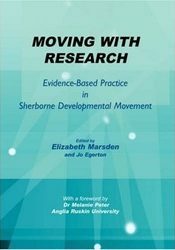 Find 'Moving with Research' at Amazon. 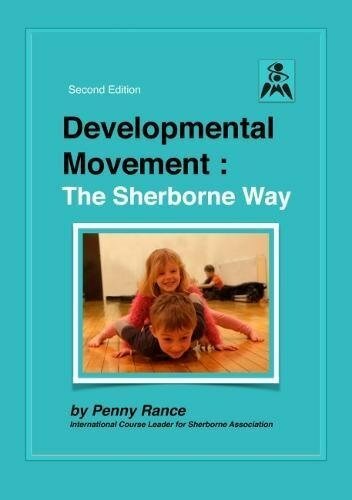 This is the second edition of a book written by Penny Rance M.Ed., which explains the basics of Sherborne Developmental Movement. The book is spiral bound and has an accompanying DVD with photo galleries and movies illustrating how the various developmental stages can be applied in practice. Chapters include a background, child development, developmental stages in practice, how Laban movement analysis is applied, and a chapter about the importance of touch. The book costs £30 plus postage and packing. It costs more to send to Europe and even more to send to the rest of the world. Please choose the correct postage rate for where you want the book delivered. The first edition of this book is also available as a digital download from the iTunes Store (£14.99). This DVD was directed by Cher Mather, an International Course Leader for the Sherborne Association UK and Artistic Director of WISP Dance Club. Its aim is to support the implementation of Sherborne techniques at post Level 1 Training and show how it underpins PE and Creative Dance. It has been thoughtfully planned and put together and reflects Cher’s calm and sensitive approach. The commentary is informative and underpins the philosophy of the movement experiences seen. It clearly shows the importance of Sherborne Movement Sessions having trained and experienced staff members, who not only “know” their children, but how movement can be adapted to meet the needs of individual children, and how to support them. The need for repetitions, as well as moments of movement exploration and success are recorded showing how little steps of progress can be achieved and how these “building blocks” can lead to community creative dance in performance. Cher clearly shows that starting at a point where the child is, being able to engage that child, slowly gain their trust and confidence, helps the child to begin to feel at home in his/her own body. This is by exploring body and spatial awareness experiences, at their own level in a safe, calm, interactive and encouraging environment, and is of course still fun. 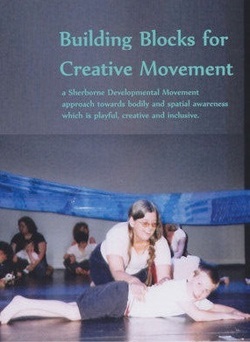 A delightful and inspirational DVD for both experienced and new Sherborne Movement Practitioners. Tel: +44 (0)121 414 3344, this is the main switchboard and you will need to ask for Special Collection to speak to someone. To view the archives use the following link for instructions about accessing these resources.